Handheld NAUTIZ X4 Android 4.2 or Windows Ultra-Rugged Mobile Computer - The Nautiz X4 is a rugged PDA with an IP65 rating, with a base unit having a Texas Instruments AM3703 1 GHz processor, 512MB Ram, 1GB Disk Microsoft WEH 6.5 or Android, 3.8G GSM HSPA+/HSUPA or CDMA EVDO Rev. A, u-blox GPS, Bluetooth 2.1+EDR , Wlan 802.11 b/g/n, USB otg. One user accessible Micro SD Card slot, 5.0 Mpixel camera with Led Flash and autofocus, speaker/mic. Each unit is supplied with a high capacity battery, a stylus pen, handstrap, AC charger, USB data cable, quick start guide. Keyboard: 1D Scanner units numeric keyboard only, 2D Imager units has the choice of either numeric or qwerty keyboard. Optional: 2D Imager N5600, Adaptus 6.0. Nautiz X4 is IP65-rated and meets stringent MIL-STD-810G test standards. The NAUTIZ X4 is a rugged barcode scanner and rugged handheld combination that can help you get the efficiency gains you need. With its integrated scanner and IP65 design the Nautiz X4 thrives in your tough conditions. It’s packed with features, it’s compact and truly portable, and it offers a reliable computing solution for challenging worksite environments. The Nautiz X4 has all you need for work on the go. It features a high-brightness resistive touchscreen for a generous and practical mobile workspace, without sacrificing portability — this ultra-rugged handheld weighs just 330 grams (11.6 ounces). The unit comes complete with either a high-performance laser scanner or 2D imager for super-fast and accurate scanning and barcoding tasks. It also features a 5MP camera with auto focus and LED Flash. An integrated GPS receiver by u-blox®, the global leader in positioning technology for professional field use, offers built-in navigation functionality. Multiple connectivity options such as high-powered 3G and Wi-Fi keep you connected, everywhere and always. 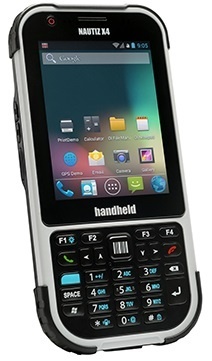 The feature-rich Nautiz X4 runs Android 4.2 or Windows Embedded Handheld 6.5 operating system. A high-speed 1 GHz processor, 512 MB of RAM and 1 GB of Flash memory make sure this device keeps up with every task you throw its way. And we do mean “throw” — in addition to being a computing workhorse in the field, the Nautiz X4 is also built to withstand rough use, such as drops and tumbles, and it’s unfazed by environmental factors such as extreme temperatures, dust and water, proved by stringent industry and military-standard durability tests. The Nautiz X4 is IP65-rated and meets stringent MIL-STD-810G test standards. You can use the Nautiz X4 in heavy rain or bright sunshine, fog or dust — and when you’re done, just rinse it off and toss it in the truck with the rest of your gear. A valuable tool for warehousing, logistics, field service, security, public safety and similar sectors, the Nautiz X4 rugged handheld is built to go wherever your work takes you.